Too much hype? Too many choices? Not enough Resources? There are many trends and fashions around ‘improving IT Service Management’ : Service Catalog? Automation? Cloud? Social ITSM? SelfService? Problem Management? Configuration Management? The list goes on and on. Ideally we’d do all everything, but in reality we are all very limited in the most basic resources – the people, the time and the money. So where should you invest your limited resources to get a real benefit? 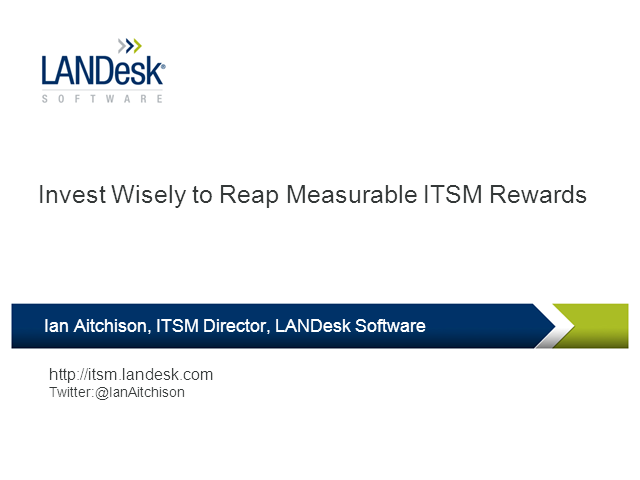 In this session Ian Aitchison (LANDesk ITSM Director) discusses current ITSM trends, and identifies those ITSM improvements that have a real benefit which can be seen, felt and – most importantly – measured.